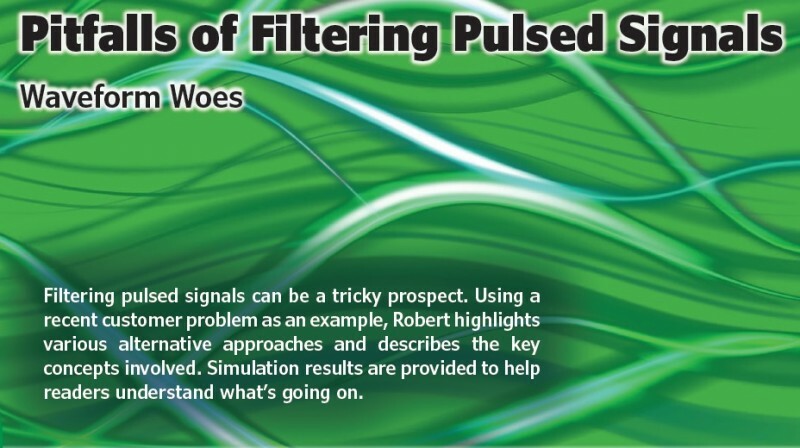 Filtering pulsed signals can be a tricky prospect. Using a recent customer problem as an example, Robert highlights various alternative approaches and describes the key concepts involved. Simulation results are provided to help readers understand what’s going on. Welcome back to the Darker Side. A couple of months ago, one of our customers was having trouble with its project and called us for help. As is often the case, the problem was more a misunderstanding of the underlying concepts than any kind of hardware or software issues. We helped him, but because the same issue could jeopardize your own projects I thought it would be a nice topic for this column. What is it about? Of course, I won’t be able share the details of our customer’s project, but I will describe a close example. Let’s imagine you need to build an ultrasonic ranging system. Just as bats do, you want to transmit short bursts of ultrasound, then listen for echoes. As you probably know, the time between transmission and reception divided by twice the speed of sound will give you the distance of the obstacle. Moreover, the shift in frequency between transmitted and received bursts will give you the relative speed of this obstacle, thanks to the so-called Doppler shift. Ok, but how will you design such a ranging device? First, you’ll need to generate and transmit bursts of sine waves—also called tone bursts—with the proper ultrasonic frequency, say 40 kHz. That’s easy to do even with a pair of trusty NE555 chips or NAND gates, or maybe with a microcontroller if you prefer dealing code rather than a soldering iron. These bursts will need to be as short as possible—maybe 1 ms or so—because this will improve the distance resolution. The transmit side is easy, but the receiver will be a little more complex. In real life, the received signal will have a very low amplitude and probably plenty of added noise. This is especially true if you consider that the Doppler shift could be significant, meaning with fast-moving objects. In that case you will not know the exact frequency of the burst you should detect. Shown here is a basic ultrasonic meter. A narrow band-pass filter, tuned to the received frequency, allows you to reduce perturbations and noise. But does this work? One possible architecture to avoid this problem, while minimizing noise, could be the one illustrated on Figure 1. First, do a spectrum analysis of the received signal. Because this signal contains noise plus the received ultrasonic echo, its frequency spectrum will show a peak at the frequency of the received ultrasonic carrier. Therefore, you can measure this actual reception frequency. Assume it is 40.5 kHz due to Doppler shift. You can use this information to tune a very selective band-pass filter, which will isolate the received ultrasonic burst from any other noise. Why not a 40.5 kHz +/-100 Hz filter? You will then recover a clean version of the received pulse and measure the time difference between transmission and reception with a detector and a time counter. Brilliant idea, isn’t it? If you agree, then please read on. This was the concept used by our customer, and unfortunately it doesn’t work! At least not as described. In this article I will explain why, using some easy to understand simulations and as little math as possible. So, don’t’ be afraid. Come with me to the Darker Side of pulsed signals. Before going into the explanation, I need to present you an alternative version of this intended receiver. 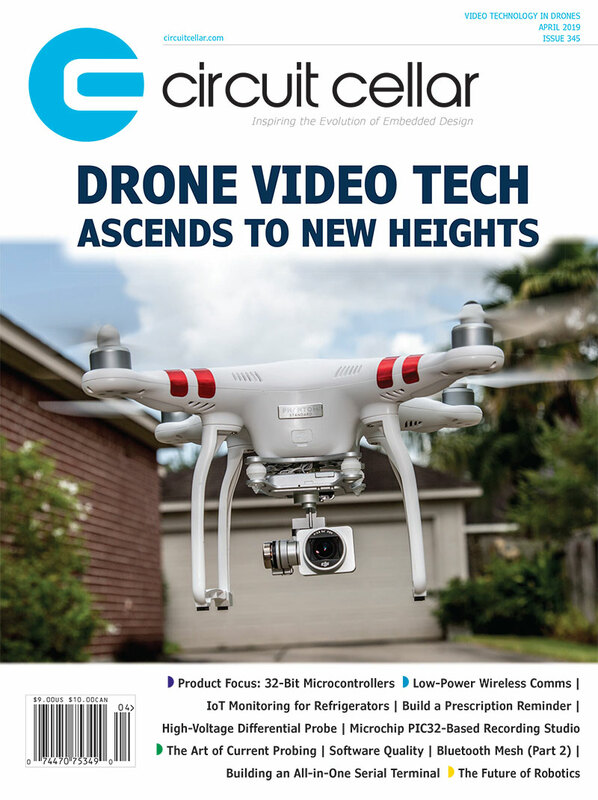 Because you are a reader of Circuit Cellar, you know that developing such a design would be far easier using digital signal processing than trying to build analog spectrum analyzers and precisely tuned filters. The digital equivalent of this receiver is illustrated on Figure 2. Just compare it with the former, you will find the same concepts. Here’s a digital version of the same concept shown in Figure 1. All the yellow functions can be executed on a digital processor (fast microcontroller, digital signal processor, FPGA or anything else). This entry was posted in Archive Article, CC Blog and tagged ADC, band pass filter, DSP, filters, MCU, microcontrollers by Circuit Cellar Staff.